Russia is not the first stop on the map for outsourcing. Compared to India, Russians are too expensive – and too inventive – which is why the majority of their good ideas require someone else to implement them. Some technical inventions that make life simpler start out by making the life of their inventor easier. Nikolai Abkairov is a prime example. The computer programmer from the Moscow exurb of Zelenograd was simply annoyed by the traffic he encountered on his way to work in the Russian capital. While others opted to take the train, but Abkairov decided to start working from home, collaborating with Ramu Sunkara and Bhaskar Roy, two Americans of Indian descent, who were planning on leaving U.S. software giant Oracle. In early 2007, after nine months of development, the prototype for a company that became known as Qik was finally finished. The program was aimed at increasing the functionality of mobile telephones. It enables mobile phones owners to upload videos and to make them accessible to friends. The app, which is now also available for video phones and chats, is now used by more than 10 million users around the world. The start-up of had a meteoric rise, and in January 2011, the company was purchased by Skype for $121 million. Today, Qik employs 50 programmers in Zelenograd . Graduates of the National Research University of Electronic Technology, which is also located there are in the envious position of having an excellent prospective employer just around the corner. Until now, Russia has been known more for talented programmers than business savvy, but more and more Russia-based IT companies are finding commercial success. Moscow-based software manufacturer Abbyy has become known for its text recognition program FineReader and its electronic dictionary Lingvo. At this year’s CeBIT, a major international trade fair for the IT industry, Abbyy focused on business solutions, as well as document and data capturing. The most successful international Russian IT company is without question Kaspersky Lab, which produces anti-virus software. Its earnings totaled $612 million dollars last year alone – a 14 percent increase over 2010 and a 57 percent increase over 2009. And 80 percent of this revenue came from abroad. Three other industry heavyweights have concentrated their efforts in the Russian-speaking realm: Russian search giant Yandex, and social networking sites Vkontakte and Odnoklassniki. Partially as a result, an increasing amount of start-ups are being tailored for the international markets right from the beginning. Alexander Galitsky, co-founder and manager of the Russian venture fund Almaz Capital, believes that Russia’s greatest advantage lies in the “excellent programming institutions,” which provide their students with a first-class education, training software developers to be able to tackle complex problems. “Solving difficult problems, analytics, large quantities of data and algorithms are all areas where Russia can compete on a global scale. Those are traits once can expect when working with Russians,” Galitsky said. Galitsky proves his point by comparing two popular smartphone games. According to him, the more popular “Angry Birds,” from the Finnish Rovio Entertainment Studios, is not nearly as challenging as the similarly popular “Cut The Rope” from the Moscow-based ZeptoLab. “’Cut The Rope’ has a completely different intellectual level,” and it is precisely this intellectual ambition that gets in the way of the Russian programmers. Ten years ago, many felt that Russia could be the first choice for IT outsourcing from the West, said Georgy Pachikov, head of Moscow-based Parallel Graphics. But, said Pachikov, “Our programmers see a piece of software and think to themselves, ‘I can do better than that.’ In outsourcing, you have to stick to the regulations, which require a certain amount of discipline. A better situation for Russian firms is collaboration with Western companies, according to Alexander Vovkula, the technical director of Parallel Graphics. “If the customer is not sure what they want, then welcome to Russia,” he said. Andrei Andreyev, creator of the social discovery website Badoo, has lived in London for the last six years. The son of scientist Wagner Ogandzhanyants, he moved with his parents to Spain in the 1990s but later returned to Russia. Andreyev founded his first Internet project, the web analytics service SpyLog, in 1999. Three years later, he launched Begun, an online contextual advertising firm. In late 2003, Finam Holding bought an 80 percent stake in Begun for $900,000. In conjunction with Finam, Andreyev created the dating site Mamba, in which Mail.ru bought a 30 percent share for $18 million in 2007. After receiving his cut, Andreyev started the social discovery network Badoo. There are currently around 130 million registered users. Judging from transactions with similar companies, Badoo, of which Andreyev owns about 80 percent, is now worth around $1 billion. Soviet émigrés Gregory Shenkman (left) and Alec Miloslavsky (right) met 30 years ago in San Francisco when Miloslavsky was working at Pixar Studios and Shenkman was selling telecommunications equipment. To create the company Genesys, each borrowed $75,000 from their parents. Together they began to develop software that allows corporations to obtain information about phone bills and minimize phone line wait times. Russian programmers made up the backbone of the company’s staff, which initially led the FBI to suspect the company had ties to the Russian mafia. In 1997, Genesys had an IPO and three years later was bought by Alcatel for $1.5 billion. After that, the partners created the group Exigen Services, which works with outsourcing programming in Latvia, Russia, and China, although its headquarters are still located in San Francisco. Investment company Exigen Capital, along with Universal Music, established the company Equa Trax, which develops programs for calculating artists’ royalties. David Yang was born in Yerevan, Armenia, graduated from a physics and math high school, and enrolled at the Moscow Institute of Physics and Technology. He founded the company Bit Software in 1989, while he was still a fourth-year student. He later renamed it ABBYY. His company’s most popular products are the optical recognition system ABBYY FineReader, which has more than 20 million legal users worldwide, and the ABBYY Lingvo dictionaries. He has opened several restaurants in Moscow and promoted the restaurant business management system iiko. In 1993, Alexander Galitsky, PhD, sold 10 percent of his IT company ELVIS+ to American computer giant Sun Microsystems. After that he took up venture investing, founding several funds that invest money in programmers’ start-ups. His successes are clear: last winter, Skype bought 20 percent of Qik, a company owned by his fund Almaz Capital Partners, that develops software for mobile videoconferencing. The company was valued at $150 million. 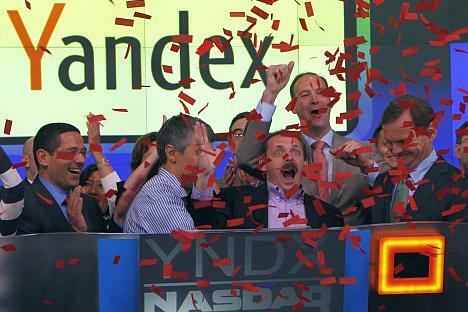 The company’s portfolio also includes a minority interest in Yandex and the software developer Parallels. Levchin’s family moved from Kiev to Chicago in 1991. Seven years later, he and his partners founded the company Fieldlink, which was later renamed PayPal. By that name, the highly successful online payment service became one of the principal ways of paying for goods on the web. In 2002, eBay bought the company, and Levchin started a new project, Slide, a photo-sharing service for social networking sites. In the summer of 2010, Google bought it for $182 million and Levchin became vice president of Engineering at Google. A year later, Slide was shut down and Levchin resigned. This article originally appeared in Russian here.